Solar panels are helping students, teachers and administrators in Lylburn Downing Middle School visualize the impact they have on the environment. Administrators said students like the daily reminder the panels give to stay conscious of the energy they use. The company behind the project—Secure Futures, headquartered in Staunton—designs, finances and operates the solar panels for tax-exempt buildings, according to company CEO Tony Smith. The firm installed the panels on Lylburn Downing’s roof in September 2016, with the goal of completely offsetting the school’s electricity usage. 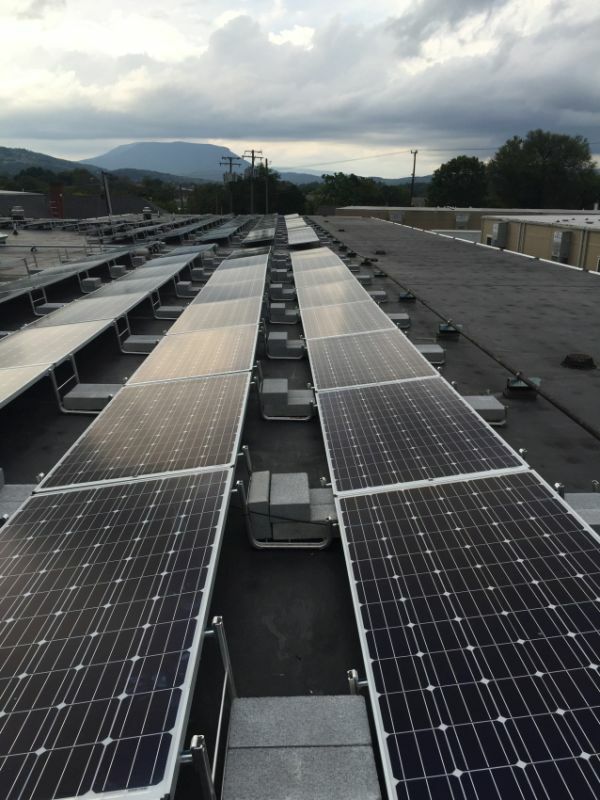 Staunton-based company Secure Futures provided the solar panels that cover the roof of Lylburn Downing Middle School. Smith said that Secure Futures, which provides solar panels to buildings with large rooftops and the ability to harness solar power, is also interested in protecting schools’ pocketbooks. Secure Futures also participates in educational workshops. The company on Monday partnered in a workshop for teachers at Albemarle public schools. 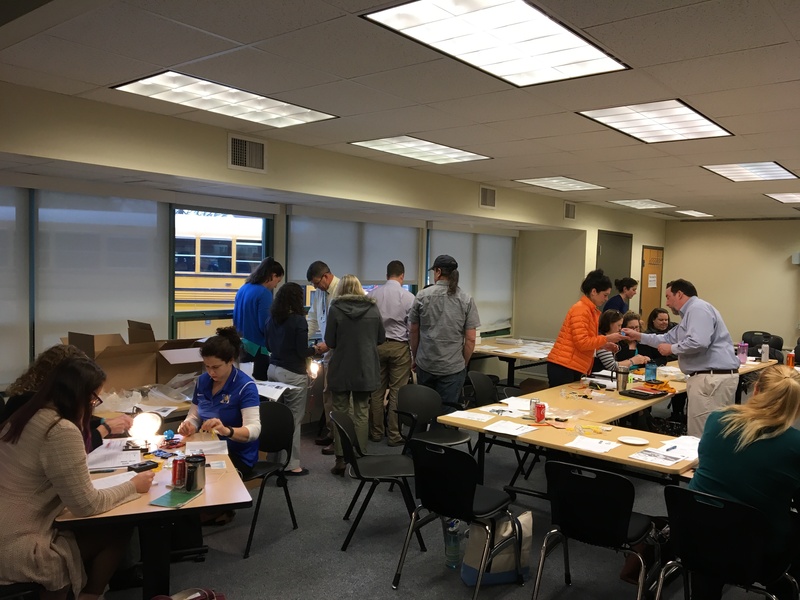 Collaborating with Secure Futures was National Energy Education Development (NEED), a nonprofit organization based in Manassas, Virginia, that provides energy education to over 65,000 classrooms nationwide through kits and materials. NEED also brought teachers to the workshop who had previously taught classes incorporating solar-panel technology and related concepts. “It’s really to move solar from the rooftop to the classroom,” Smith said of the workshop. Amory Fischer, the business coordinator for Secure Futures, explained how the workshops not only contribute to school curricula but also help the solar-power business. “The goal [of the workshops] is to provide access to the teachers on how to use those tools in the classroom, and also to be able to provide an opportunity for the students to be able to learn about a growing industry,” Fischer said. NEED also provides kits and materials for classes that are geared toward the Standards of Learning tests students take at the end of each school year. Aside from increasing students’ understanding of class topics, Secure Future’s Smith said he thinks it is important for students to become active leaders in their communities and in the careers they choose. “To understand the relationship between sun that we enjoy for many other purposes and how it can be harnessed in a very beneficial way to reduce our carbon footprint becomes a great learning opportunity,” he said. Six Albemarle County public schools have also worked with Secure Futures to install panels on their roofs. Teachers from each of those schools attended Monday’s workshop. Teachers from Lylburn Downing will attend a similar workshop in the fall. 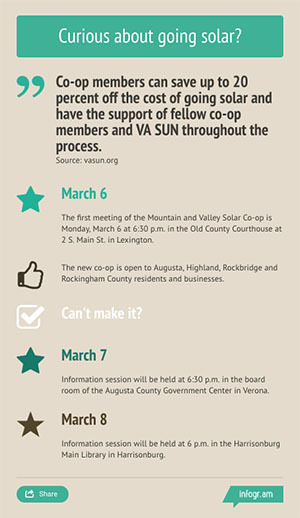 Fischer said solar energy conversations were started in Albemarle schools by students. In 2013, a group of students and community members organized a presentation for the school board about solar power. The Albemarle public school system then issued a request for bids on the panel installation project, and Secure Futures won the contract. Albemarle County schools science coordinator Robert Munsey organized Monday’s workshop. Munsey said he appreciates the effect students have on the community as a whole. “Anytime we have kids going into the community and talking about what they’ve learned, or people going by the schools and seeing the giant panels beautifully across the roofs, the community grows an appreciation for solar energy,” he said. Ricky Vrhovac, principal of Sutherland Middle School in Albemarle, said the biggest benefit he sees is the students’ recognition that humans are contributing to climate change, and that they can do something about it. “By us doing absolutely 100 percent nothing, we’re generating electricity that can be used in our community or somewhere along the grid to reduce the number of houses that rely on fossil fuels,” he said. The benefits of solar energy are reflected in the Lexington area’s private sector as well. Like the students and staff at Lylburn Downing, two Lexington residents are learning just how useful solar energy can be. Carroll Comstock and Betty Besal installed solar panels on their roofs last April. Since then, both have seen a hefty reduction in their monthly electric bill, from over $70 to around $8.50. Financial benefits aside, Comstock said he likes the idea of reducing his negative impact on the planet. “I like the warm and fuzzy feeling that your carbon footprint is not as big as it used to be,” he said. Besal said she has always been interested in humans’ dependence on energy. Her house was built two years ago with the primary purpose of minimizing energy usage. Lexington’s Superintendent of Schools Scott Jefferies said he thinks there might be more interest in solar technology as a line of work now that students are studying it earlier. Later this year, Secure Futures is expected to install picnic tables with tent-like roofs covered with solar panels at Lylburn Downing and Albemarle schools, allowing anyone to charge a computer or phone directly from the panels. It’s another way of strengthening the students’ and communities’ connection to the uses of solar power, Munsey said.